The Healthy Baby Guidebook: Purchase Today on Amazon! This is the perfect gift for anyone thinking of starting a family, getting or is currently pregnant, has children (regardless of the children's age), has children in the family (maybe you're an Aunt or Uncle) or anyone who is interested in health and understanding food whether or not you have children! Although this is geared towards feeding babies over half of this book applies to everyone! Yes, to everyone. That's because health is health, and healthy food choices and understanding fundamentals of food education are the same across the board regardless of age. In a world where marketing campaigns are bombarding health-conscious shoppers, it has become increasingly more difficult to separate healthy food facts from health- propaganda. In The Healthy Baby Guidebook, author and Acupuncture Physician, Juliann Abecassis, decodes the chaos of understanding food and teaches you the necessary fundamentals for health. With a surprisingly easy-to-understand format, you will become triumphant in understanding food, breaking down misconceptions, and be well equipped with the necessary tools to raise a healthier generation. 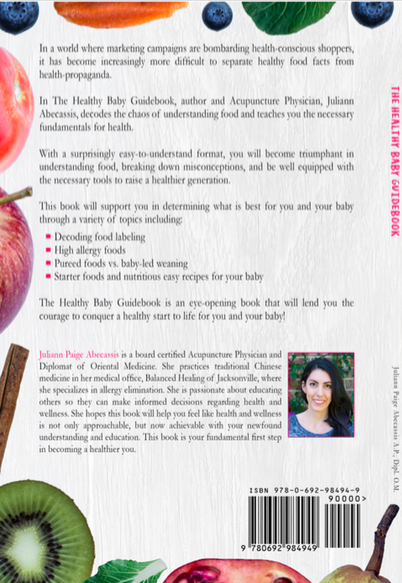 The Healthy Baby Guidebook is an eye-opening book that will lend you the courage to conquer a healthy start to life for you and your baby! Juliann Paige Abecassis is a board certified Acupuncture Physician and Diplomat of Oriental Medicine. She currently resides in Jacksonville, Florida, where she practices traditional Chinese medicine in her medical office Balanced Healing of Jacksonville. She is advanced certified in NAET allergy elimination, in which she specializes. In her practice she helps her patients understand the root cause of disease in order to correct underlining imbalances to restore health. Juliann is passionate about educating others so they can make informed decisions regarding health and wellness. She believes a lack of patient education is a significant shortcoming in our healthcare system. As a result, many individuals have consented to things they do not fully understand or have consented without receiving full disclosure on medical practices or alternative treatment options. This a common theme that has shown up time and time again in many of her patient's past medical histories. These things should never happen. She believes if she can help others navigate through the process of understanding patient rights they will be able to make the best informed decisions for themselves and their loved ones. On a typical day you can find Juliann enjoying time spent outside, blogging about heath and wellness on her lifestyle blog SimpleMindfulLiving.com, working in her practice, or spending time with her loved ones. She loves to cook and travel as well as educate and inspire others to find balance in a healthier, happier life. She hopes this book will help you feel like health and wellness is not only approachable, but now achievable with your newfound understanding and education. This book is your fundamental first step in becoming a healthier you. This book was written for her patients, friends, family, and all who seek similar guidance. Regardless if you have a child, she hopes this book is applicable to everyone.